For thousands of years, the beauty of the Three Gorges has been a source of inspiration for countless poets and painters. This tour will lead you from the ancient metropolis Xi’an and its world famous terracotta warriors to the Yangzi, crossing the Qinling mountain range which divides northern from southern China. We cycle off the beaten tracks of mass tourism and discover the rough beauty of provincial China as well as the fascinating waterway culture along the country’s longest river. The cycling tour will be framed by a three-day stay in the capital Beijing at the beginning and a visit to Shanghai, China’s “secret capital” at the end. Cycling and walking through the city, we experience the stunning remains of Imperial China. We cycle to the Temple of Heaven, one of Beijing’s landmarks which is still a popular meeting point for locals doing their morning exercise. Then we head northwards, walking over Tian’anmen square to reach the Imperial Palace Museum, aka the Forbidden City. Finally we climb Jingshan hill north of the Palace to enjoy the view over the roofs of the Forbidden City and its surroundings. Today, we go on a hike on the Great Wall of China. By bus, we reach the Great Wall at Huanghua, a section located 70 km north of Beijing which is still untouched by mass tourism (optional). In the evening we board a comfortable sleeper train to Xi’an. In the morning we reach Xi’an. After a short rest in our hotel we discover the city which once was Chinas capital and the world’s biggest metropolis. We visit the old city wall and explore Xi'an's muslim old town. We cycle from Xi’an to Lintong where we visit the world famous Terracotta Warriors in afternoon. This stage leads us from Lintong to Mount Hua (Hua Shan), the westernmost of Chinas five sacred Daoist mountains. We stay two nights stay in a hotel at the foot of the mountain. Daoism will be the main theme of today’s six hour hike to the peaks of Mount Hua. On our ascend we pass numerous temples which have recently regained their significance as centres of religious worship. For the next three days we head southwards through the Qinling Mountain Range. Far off the usual tourist routes we cycle though scenic valleys and picturesque villages. Passing Luonan, Shangluo, Shanyang, we reach the old merchant town of Manchuan on day 12. After our arrival we go on a stroll through the old town. Crossing dreamlike highlands we reach the valley of the river Han in the afternoon. After one overnight stop in Shuhe, we follow the river’s course to Ankang. In Ankang, a pleasant mid-size city at the banks of River Han, we stay for a whole day. You can join us on a little cycling trip to explore the city or simply enjoy an earned day of rest and relaxation around the hotel. During the next days we slowly approach the Yangzi valley. Staying on mostly flat terrain we reach Pingli on day 16. Through rugged valleys our tour carries on towards Zhenping on day 17. Cycling through this area, we get a picture of the simple farming methods still applied to cultivate the patched fields in China’s mountainous areas. At the Jixinling mountain pass we reach the “geographic centre of China” as well as the watershed between Northern and Southern China. After a long and beautiful descent on smooth roads we carry on cycling through the narrow gorges of the River Daning towards Wuxi. We get up early to ride todays mountainous stage with no time pressure. In the afternoon we reach Fengjie, the town which used to be the marker to the beginning of the Three Gorges for many centuries. Parts of the city have been swallowed by the water during the flooding of the the Three Gorges, a process which was famously documented by director Jia Zhangke in his atmospheric film “Still Life”. On our way to Wushan, we stop to visit Baidicheng, the “White Emeror City” which used to be subject of many poems and songs. 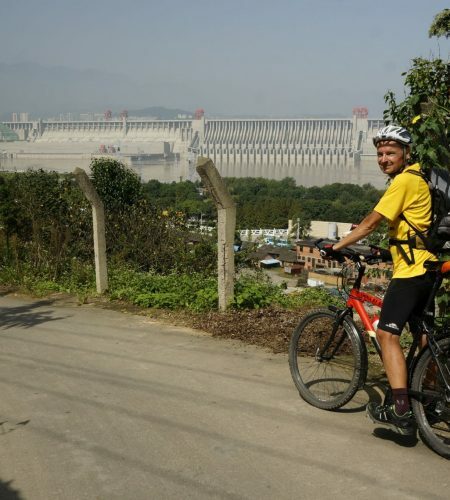 Cycling further on we cross two mountain passes before arriving in Wushan which lies at the confluence of Daning and Yangzi. On the next day we explore the picturesque “Little Three Gorges” of the Daning on a small boat and stay for another night in Wushan. On a chartered Boat we navigate through two of the famous Three Gorges of the Yangzi. At Xin Zigui, a city newly built after the flooding of the Gorges, we go ashore and visit the gigantic Three Gorges Dam in the afternoon. NOTE: Due to changing traffic regulations it might not be possible for us to take the boat all the way from Wushan to the dam. Before the start of the tour, we will inform you about the current situation and possible changes in the itinerary. On our last cycling stage, we ride through the Eastern part of Xiling Gorge to Yichang. On our way we pass Huangling Miao, a temple dedicated to the the sage emperor Yu who is famed for his introduction of flood control in ancient China. In the morning we board a train to take us East. Through the train windows, we watch the fertile plains of central China roll by as we approach Shanghai, our final destination. A stroll through Shanghai, China’s gate to the west, will be the final venture of our journey. We walk over the World famous Bund and stroll through the city’s shopping district at Nanjing Lu and visit the beautiful Yu Garden. We then cross the Huangpu River and enjoy the view from the top of Pudong’s giant skyscrapers. The afternoon can be used for further sightseeing, shopping or other individual ventures.